A ‘lake of blood’ has been predicted in the ancient, rebel-held Syrian town of Idlib. 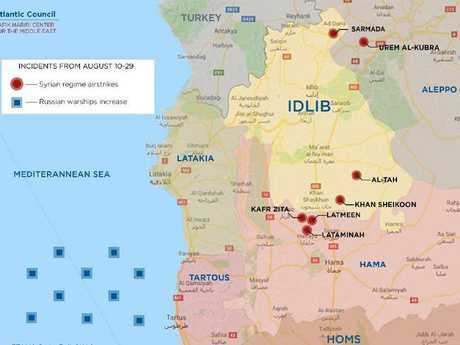 A "lake of blood" has been predicted in the ancient Syrian town of Idlib as Russia prepares to obliterate what it says is the largest al-Qaida terrorist safe haven in the world. The Operation, called #IdlibDawn, has begun in Idlib province surrounding the town 59km southwest of the Syrian city of Aleppo. Despite fears of a humanitarian disaster, Russian President Vladimir Putin and Iranian leader Hassan Rouhani seem determined to bomb the last rebel stronghold and end, once and for all, Syria's seven-year civil war. are up to 30,000 rebel and jihadist fighters who have fought President Bashar al-Assad's Syrian army. 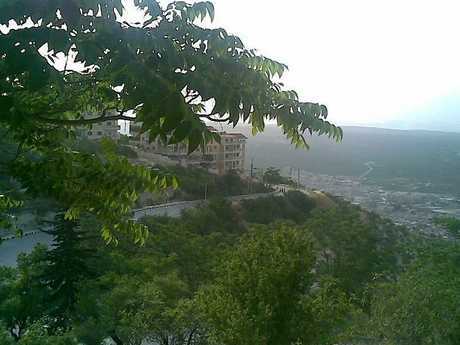 They have fled there from rebel opposition strongholds recaptured by Syria's Assad regime. But most of the estimated three million people occupying Idlib and its surrounding areas are civilians, including one million children. In recent weeks, Russia and Syria have carried out intensive air raids on rebel-held strongholds in Idlib province. Russian news reports the air strikes on Idlib in Syria where a ‘lake of blood’ among civilians has been predicted. Map of Idlib in Syria where the offensive has begun amid fears Russia will annihilate innocent citizens to end civil war. Picture: Etana Relief Web. 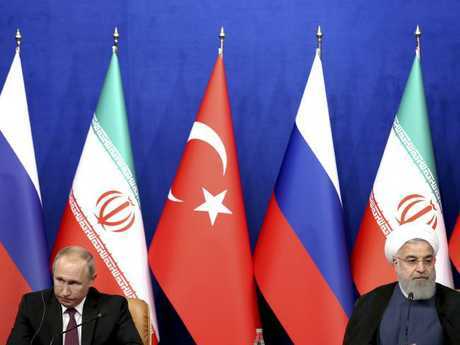 Two days ago in Tehran, Mr Rouhani and Mr Putin held a joint press conference with their Turkish counterpart Recep Tayyip Erdogan to discuss the war in Syria. The main point of the conference was a proposed military offensive to retake the last rebel-held bastion of Idlib. Rouhanai and Putin rejected calls for a truce, but Erdogan pleaded with Putin, warning that Idlib could turn into a "lake of blood". On Saturday, Syrian government helicopters dropped 19 barrel bombs on targets in Idlib and neighbouring northern Hama, the BBC reported. 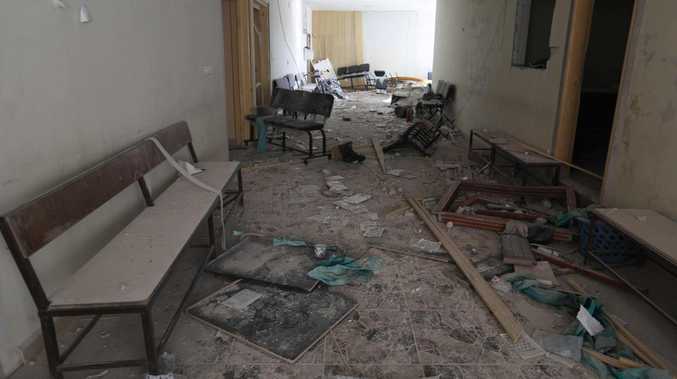 A local Idlib media centre and the UK-based Syrian Observatory for Human Rights (SOHR) also reported that Russian warplanes had staged 68 strikes. Russian jets bombarded southern Idlib, attacking the city of al-Habit, and struck in the east of the province. Victims including children were killed in the raids, the "most violent and heaviest" since the previous month. Corner in Idlib with the rebels are entirely blameless citizens, who along with their activist neighbours are unwilling to risk flight from the province. 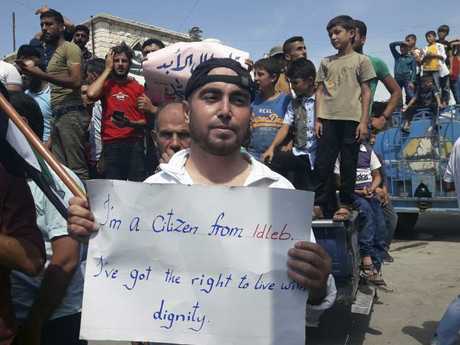 Idlib activist Mustafa Alabdullah protests against Syrian President Bashar Assad and his troops' imminent offensive. Picture: Mustafa Alabdullah. A tranquil olive grove in Idlib, Syria where a bloodbath is predicted from Rusiann air strikes. The United Nations has previously flagged the possibility of Syria establishing "humanitarian corridors" for human flight, but locals don't trust the Assad Government. "The problem is that the Assad regime will eradicate all the civilians who will attempt to go through humanitarian corridors," an Idlib province man Omar told The Guardian. "If they're not murdered they'll be sent to jail. Civilians are more scared of regime prisons than getting bombed." But fleeing refugees are a certainty, and Idlib's proximity (about 100km by passable road) from the Turkish border has worried that country's officials. Meanwhile, the air strikes continue. US President Donald Trump has said that Mr Assad should not attack Idlib. In April 2017, the world reeled at the news of chemical attacks on Idlib province which left dozens dead. 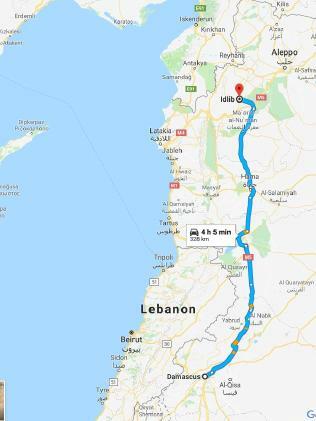 Idlib lies 450km north of the Syrian capital Damascus. Horrifying footage showed adults and children writhing in pain and frothing at the mouth, as well as mounds of the bodies of children with white foam around their mouths and noses. A US government source told Reuters it believed the chemical agent sarin was used in the attack that was "almost certainly" carried out by forces loyal to President Assad. At last week's meeting between Putin and the Iranian and Turkish presidents, the Russian leader said he would continue to fight "terrorists" in Idlib. 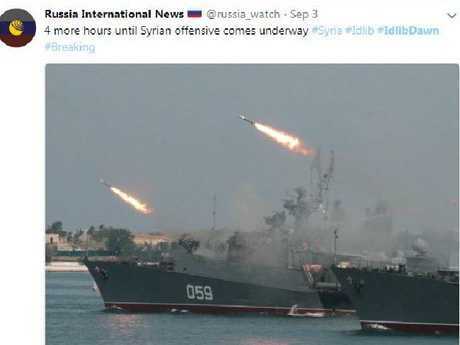 Russia International News tweeted last week that "proud Russian, Iranian and Syrian troops will officially begin their offensive at dawn" before strike killed 13 people. #IdlibDawn and #IdlibOffensive are trending on Twitter, as the world waits to see if Turkish President Erdogan's terrible prediction of the "Lake of Blood" come real for the town. Russian President Vladimir Putin and Iran’s Hassan Rouhani, at the talks which rejected a truce for Idlib. Picture: Ebrahim Noroozi.